Thank you, thank you, thank you for helping her! MIA wrote: OMG I love her, bless you for taking her in. Please give her a kiss from me. Will do; she comes back home today from the Vet. On Saturday she was laying on a nice new costco dog pillow & we noticed her stump was quite swollen. Just as I was mid-dial to the vet... it popped. Basically she built up a fluid pocket for whatever reason & it popped and drained everywhere (yuk)... so the vet said to bring her in & kept her for a few days to ensure that she doesn't get an infection. So I'll try to take some pics in the next couple of days of her; she's been doing great - fluid pocket aside. Geez you have your work cut out for you! I'm sorry to hear about Hope's popped fluid pocket that sounds painful and messy. Good luck to Cody on his surgery. I'll let the rescue know; we may take you up on the offer. And thank you for making it BTW. Ms. Hope is home and doing well. Her stump drained and the surgeon left it a little open to ensure it doesn't fill up again, but as of now it doesn't look like it has/will (hopefully!). She's chiliing on the futon at the moment. Cody's getting his TPLO surgery today so she's flying solo and I think loving having the run of the house. I have a few pics, I'll try to upload them in the next few days; it's been a bit crazy around here the past 2 months with all the vet runs and dog excitement... I'm looking forward to it calming down with Cody in the crate for the next 6 weeks and Ms. Hope healing. As for her training, it's going well. She is really the most stubborn dog we've encountered, but we just patiently wait and she eventually does that which was requested. We're also working with the rescue to set up some play dates for dogs they think will be compatible with her to expand her social circle. We won't have those for another week at least given we want her amputation site to fully heal (and not fill up again), but all in all, I'd say she's through the worst of it. And as I mentioned before, she's got such a sweet nature. It's really amazing to see her come out the other side so to speak. She's happy to see you and just wants to have the easy life these days (and who can blame her). So I'll keep you all updated and will try to post pics in the coming days. Thank you all for the kind comments. My wife and I are just happy we could help her! Sorry for the late responses; it's been crazy around the house with Cody recovering from TPLO surgery and me starting a new job. Here's some pics of her from the past few weeks. She's doing great. Fully recovered after all her surgeries and her most recent one to remove some sutures that didn't dissolve from her spay - she was having a reaction to them. But she's 100% now... just needs to find her forever home. Hope looks beautiful in RED! I will pray her forever people find her soon. So a random day bump for Ms. Hope. She's still with us, getting better at obedience and getting some much needed socialization when the rescue folks have time to bring over their dogs. Anyone want a cute little tripod? She's missing the same front leg our Dante is - they'd make the cutest tripod BFF's! I'd take her in a heart beat if I could! But we're at our doggy limit - I hope she find a forever home soon. 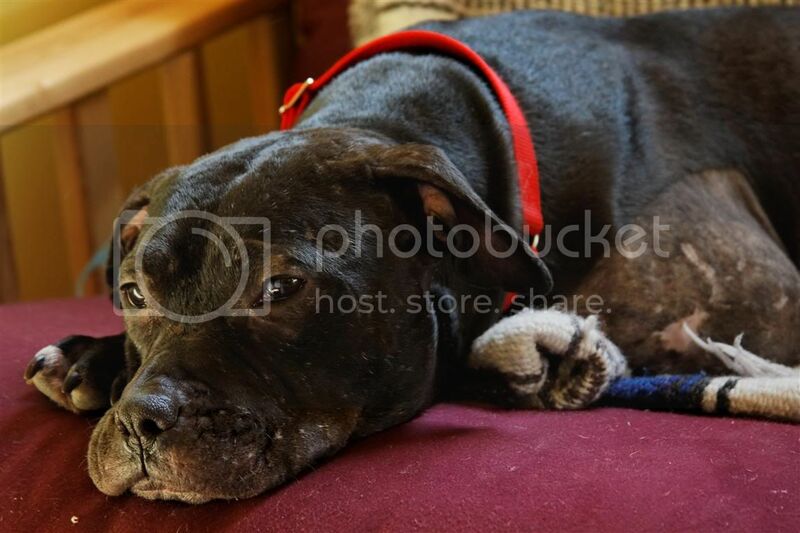 www.tripawds.com has a rescue and adoption forum - you might want to post hope's info there. I could do it for you if you don't want to create and account, I'd just need her information and contact info - or you can contact the site admin/founder and he can post it for you as well. Still praying for Hope to find her forever home. Thanks so much for the update. Hey all, just an update on Ms. Hope. I got a PM earlier asking and forgot I'd not updated this thread. 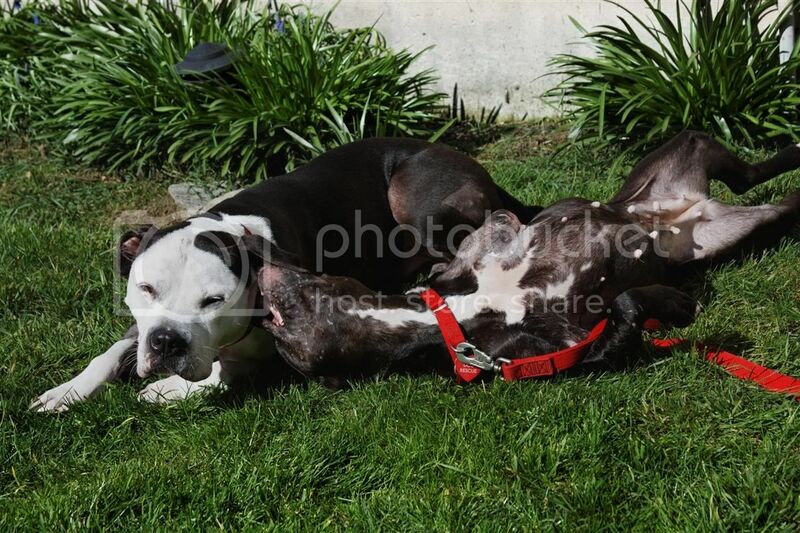 The rescue has Hope fostered now with a dog trainer who also runs a boarding business. She's taking her the next step that we couldn't as we only have 1 dog. Her new foster is helping her with much more doggie socialization - something she's really taking to from what I've been told. 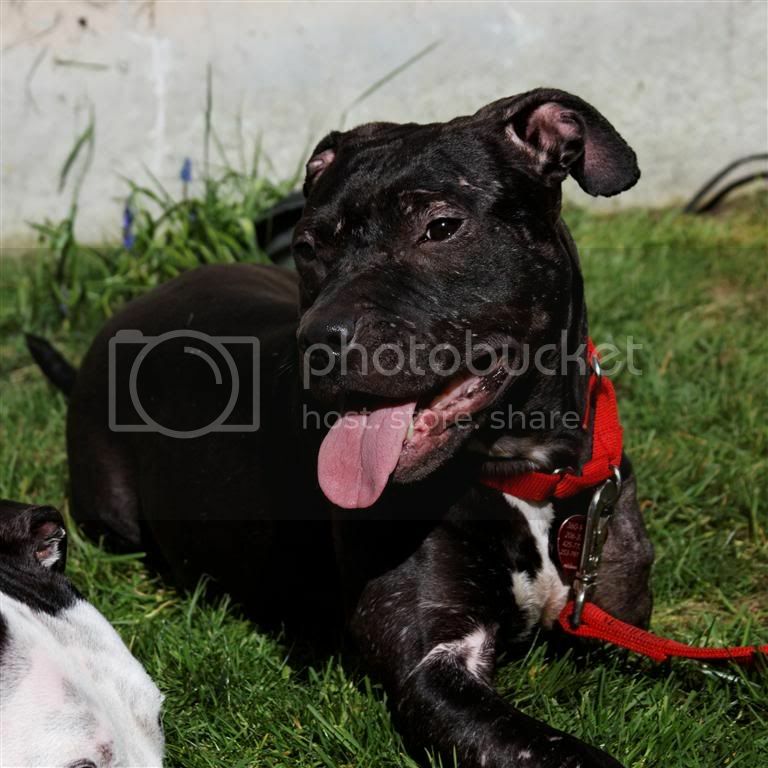 If you're interested, she's still up for adoption; check out bullseye. We keep in touch, she just really benefited from going somewhere that could really give her more positive dog exposure in a controlled setting. It was rather difficult to schedule various playdates given, well, work, life, etc. We were sorry to see her go, but knew she needed this. 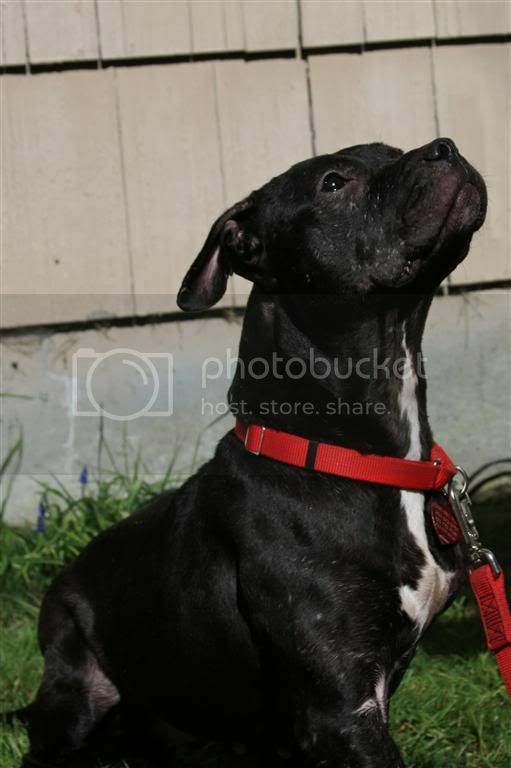 As stated before, she is a great, sweet, loving dog who is still looking for that forever home. She'd do amazing with someone not looking for a high-energy dog. While she can get going; being a tripod means no 5 mile hikes for her. Munkos wrote: She is so sweet. 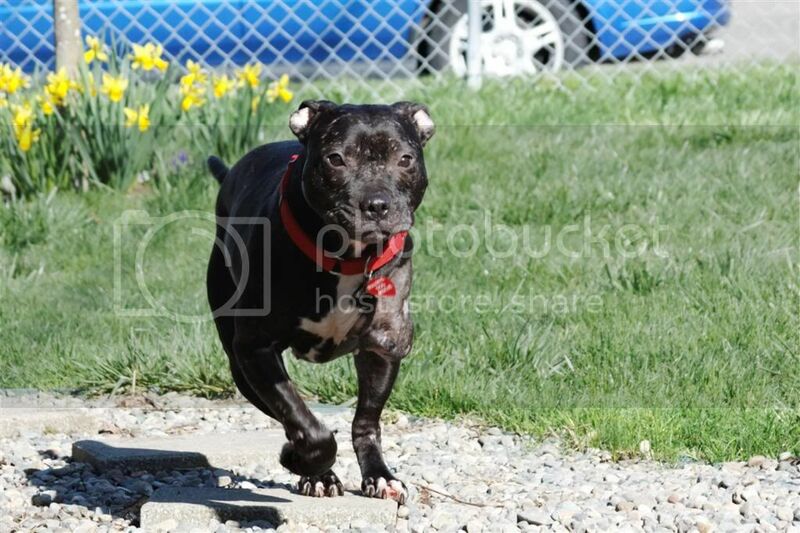 http://www.tripawds.com has a rescue and adoption forum - you might want to post hope's info there. I could do it for you if you don't want to create and account, I'd just need her information and contact info - or you can contact the site admin/founder and he can post it for you as well. By the way; thanks for the offer. I'll suggest it to the rescue.